Falls Presbyterian Church replaced their old wooden sign with a beautiful and dynamic new digital message sign within budget that will lift their brand and their community. Menomonee Falls, WI, June 22, 2017	(Newswire.com) - ​Spreading the Word to their community and creating awareness are important goals for just about every Milwaukee area church. 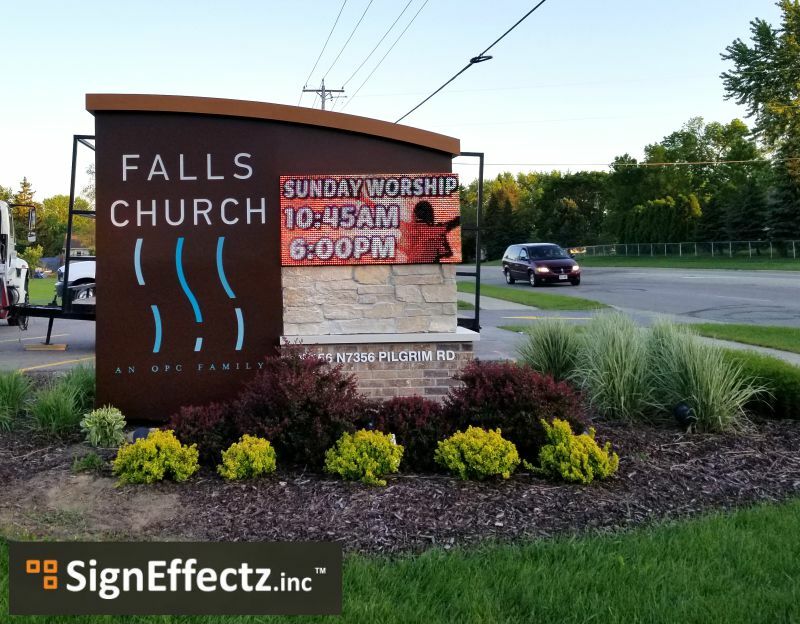 Falls Presbyterian Church had that in mind when it reached out to Sign Effectz to design and build a new digital message sign. Church administrators were seeking a serious sign upgrade from their sandblasted wooden sign to help improve the appearance of the property and to showcase their brand. Sign Effectz was able to achieve this goal and stay within the church’s budget. An industry leading 7 year parts and on-site service warranty provided by Vantage LED, an innovative LED display manufacturer based in Ontario, California. The dynamic full color displays bring the church’s target audience closer with simple to read text messages and impressive image and video quality. As the church grows, they have the flexibility to upgrade to a higher resolution by swapping out the modules in the field; no need to install a whole new display or get a new sign permit. Free professional custom content creation is provided. All slides are created for the church based on their input through a simple form in the cloud-based software. The church committee also wanted to make sure that the brick accented the church building. So, Sign Effectz showed them examples of brick, vinyls, etc. SIgn Effectz carefully removed the old sign preserving the existing foliage and plants and installed the beautiful new church LED sign. It fit perfectly. The new church sign is absolutely stunning. It will definitely grab the attention of the community passing by everyday with its beauty and the valuable messages the church shares. At Sign Effectz, Inc., they’re building the signs that build brands. They combine creativity and technology to provide customers with visually effective and physically durable signage. Their full service capabilities enable them to serve as a single source for everything from Design to Fabrication, Installation and Service & Maintenance. Their R & D team gives you access to cutting edge design options, materials and manufacturing methods, working every step of the way. As an international company, no project is too big. Let them help make your brand visible. At Sign Effectz, Inc., they're building the signs that build brands. They combine creativity and technology to provide customers with visually effective and physically durable signage.